"The MV Malabar has an identical sistership in Port Moresby Harbour called MV Macdhui"
The town of Kiama south of Sydney is famous for its blow hole. What Sydney-sider has not gone there as a kid on a school excursion to see the Kiama Blow Hole? Even now, the town is very busy on weekends as people travel there to see this fabulous natural phenomenon. In the 2000s, the crowd on weekends at the Blow Hole represents the immigrant nature of Sydney, with all the newer migrants visiting this place that they have obviously been told about. Up till about the early 1990s there was a dive charter boat that ran out of Kiama. It was called PT-73, named of course after the famous boat from the 1960s TV series McHale's Navy. I never went on this boat, as the only time I booked on the weather conditons caused the dives to be cancelled. There was a dive shop in Kiama till about the early 2000s, I think it may still have had a boat, but it did not advertise and Sydney divers probably did not even know it existed. 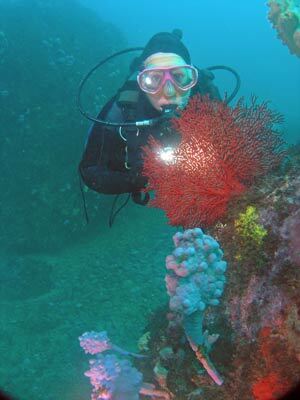 My only dive until 2010 at Kiama was at Afghan Reef. 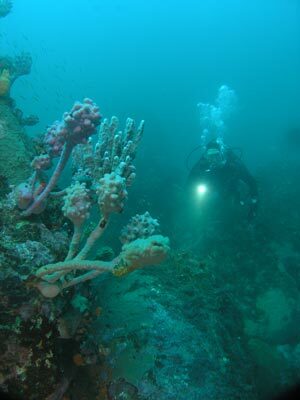 In 2010 the St George Scuba Club decided that its annual dive weekend to the near south of Sydney would be to Kiama rather than the normal Shellharbour. We had no idea what the diving would be like and, in fact, we could not find anyone who had details of sites where we could do boat dives. After a blown out Saturday, Sunday saw us heading out to dive. We decided to try the Bombo Headland but we could not find too much of interest using the depth sounder. We headed a bit further north till we were off Stack Island at Minnamurra. This is about 5.5 kilometres north-north-east of the Kiama Harbour (where there is an excellent boat ramp). Here at a depth of about 24 metres we found a site that looked very interesting. The depth sounder showed a bottom that had lots of ups and downs. We decided to try it out and three out of our four boats anchored. The location is exactly one kilometres off Stack Island at GPS Reading S34° 37' 33.0" E150° 52' 29.8" (using AUS66 as a datum - see my GPS page to see what this means). We were soon anchored and Kelly and I headed down. 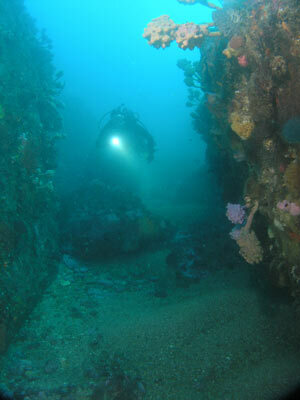 As we dropped, the bottom soon came into view, the visibility was pretty good, perhaps 15 metres. Straight away the bottom confirmed what I had expected, the bottom was composed of a sandy bottom with some huge boulders interspersed with smaller boulders. The only trouble with this is that it is very hard to navigate as all the boulders look much the same, with no distinct walls to follow. We decided to head south and then west. We went from one huge boulder to another and then to one to the west. It was easy to go around a couple that were within sight of this boulder and then return back to the anchor. Our next excursion was to the north-west. Again, we picked out the larger boulders to try to sense our route out. All these boulders are covered with the most colourful array of marine growth. 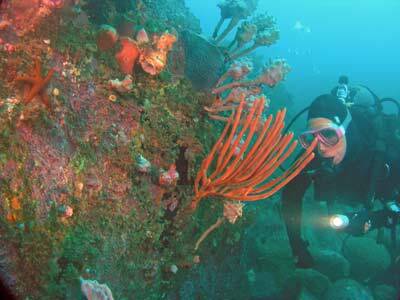 There are huge numbers of sea squirts, sponges and some gorgonias all over the boulders. The colours are absolutely magnificient. The fishlife is pretty good as well. Lots of yellowtail, silver sweep are over the reef and quite a few numbrays and even large bullrays can be seen. We saw a made-up phyllodesium nudibranch here as well as many starfish. This is an excellent dive site, worth visiting many times. As to its name, we decided that the boulders made the site look like Kata Tjuta in Central Australia. Formerly known as The Olgas, the rocks there form canyons and open areas. Unfortunately, the only way you can dive this site is if you have your own boat as no charter operator runs out of Kiama.